In February 1877 a group of women gathered at Tina R. Jones' home to found the Ladies' Literary Club of Salt Lake City. The founders established the club to stake out a space in the city for women interested in "literary pursuits and the development of mental culture." Such a space was vital to women in a city founded and governed by religious patriarchy and at a time when formal education was not expected of or easily accessible to them. Many of the women were wives of newly arrived businessmen – men who came to capitalize on the growing mining and railroad industries – who didn't belong to the dominant Mormon faith. These women sought companionship and intellectual stimulation from other women with common interests. At the time, the prevailing culture of Salt Lake may not have supported such a gathering of intellectuals, let alone women, but the club's doors were open to all women regardless of religious or political affiliation. In fact, over the years the question "What religion are you?" slowly disappeared from club discussions. For the first twenty-one years the club held meetings in members' homes or at venues all over the city, including the Odd Fellows Hall, the Continental Hotel, the Deseret Bank building, CR Barratt's furniture store, and the building that would eventually become the Ambassador Club. The Literary Club's nomadic existence was perhaps a symptom of its members' pioneering activity as public figures and leaders in the community. Salt Lake's Literary Club was the first chapter founded west of the Mississippi, one of twelve chapters total. This progressive attitude may explain why the club, while opening and fostering an intellectual and social space for women, operated without a permanent physical space in the city until 1898. That year members raised enough money to purchase their first clubhouse on 300 East below South Temple, where they remained for 15 years. 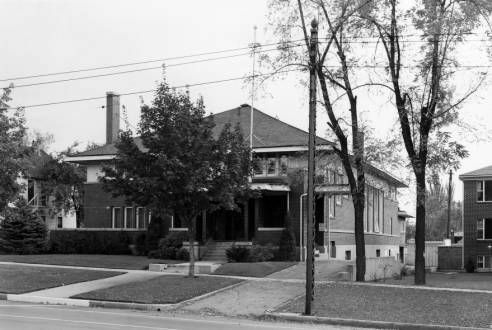 On April 25, 1913, the Ladies' Literary Club moved into what would become their permanent home at 850 East and South Temple. The women purchased the lot and commissioned the building, a prairie-style clubhouse they named "The Grand Dame of South Temple." With the beautiful Grand Dame as their home base the ladies of the Literary Club continued educating themselves and teaching one another about art, drama, music, literature, and history. They also continued to contribute to the betterment of Salt Lake, aiding in the foundation of the city's first free public library and establishing the first free kindergartens, among other things. 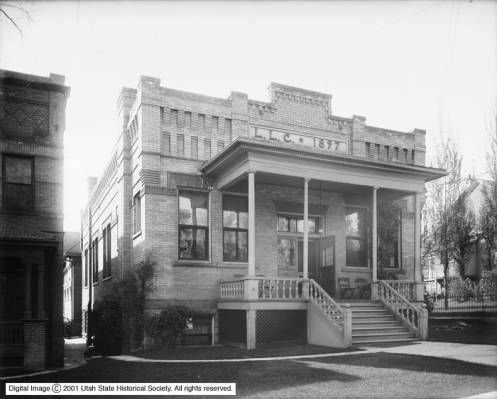 The Ladies' Literary Club established a shared history for Salt Lake women, creating a culture of social activity that has been vital to the city. 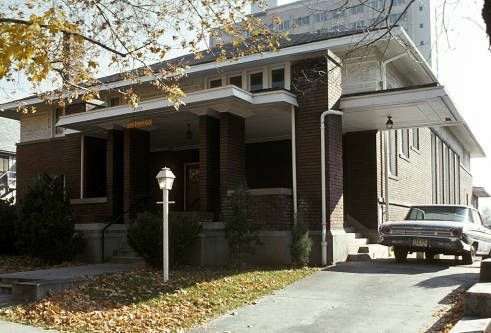 In 1987, for example, following an anti-discrimination lawsuit, the Alta Club, a social club for non-Mormon business leaders, which hadn't allowed women members in its over 100 year existence, began admitting female members. The beginnings for such a change could arguably be found in Salt Lake groups like the Ladies' Literary Club and the women who worked to establish and maintain them. And evidently after the court battle some admiring gentlemen finally took notice of the ladies and their club. In the aftermath of the lawsuit, a few even demanded to join the Ladies' Literary Club and the club graciously admitted two. They were put on kitchen duty, but they didn't last very long.